The Saigon Hotel is perfectly located right in the commercial and tourist district of Ho Chi Minh City is a great choice of 3 star Hotel for both business and leisure travelers who want to experience the Saigon's bustling life. You can easy find most of the tourist attractions, shopping centers as well as various country Restaurants in just a few minutes walk. The elegant decoration of Saigon Hotel makes a great impression on you about the culture and history of a well-known place: "Saigon - Ho Chi Minh City". Your Warm and Friendly Saigon Home! Along with Roof Bar, Saigon Paris Restaurant (41- 47 Dong Du, District 1.) is a convenient and ideal location for your Reception, Wedding, Birthday and Conference Party. when the city lights are on. The wooden inner decoration of Saigon Paris Restaurant makes you easy and warm. From 6 a.m to 10 p.m. Daily Buffet Breakfast from 6 a.m to 10 a.m.
For buffet parties: 300 pax. Massage is one of the best ways to relax after working or seeing. 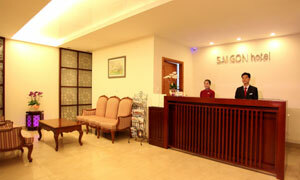 Saigon hotel 1st floor Massage service with well attendants will satify your requirement. 1 sauna, 1 Jacuzzi, 1 Steambath room.